Christina Quarles’s paintings of bodies in abstracted environments overflow with colors, textures, and patterns in what she has called an “excess of representation.” These ingredients merge and collide across different perspectival planes in fragmented yet intimate scenes. Quarles’s deliberately ambiguous figures are hemmed in by the picture plane—pushing up against and at times surpassing the limitation of the frame with arms and legs akimbo and entwined. Planes of pattern and color intersect the space and its inhabitants, never cleaving them from their site or from each other, but rather providing an opportunity to dwell in more than one space at once. Quarles has described this facet of her work as emphasizing dislocation over location, and increasingly her scenes feel otherworldly, especially when the figures appear to be unhinged from the limitations of gravity or physical ability. Quarles also refuses legible signifiers of subjectivity, making us aware of the ways in which identity is regularly placed upon us and the inherent politics of representation. A queer black woman whose fair skin often precludes her from being immediately categorized, she understands her own position in the world as unstable and transitory. In her paintings, skin tones range from orangey-pink and yellow, to shades of blue and washy black and facial features often lack detail or are obscured from view. 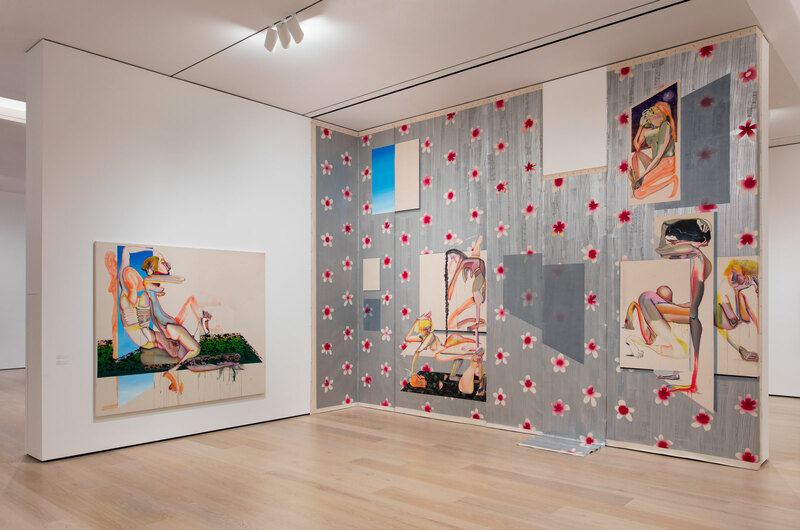 For Made in L.A. 2018, Quarles presents an environment in which a floral pattern covering the wall is disrupted with trompe l’oeil renderings of what appear to be individual paintings stacked and adjacent to one another. This large-scale installation flips the logic of her discrete paintings so that the negative space of the raw canvas, rather than serving as the ground, is used to interrupt, hold, and fragment the figures across the visual field. The inscribed texts quote and misquote a variety of sources, including poetry and song lyrics, as well as her own writing. For the artist, the emphasis on the surface and the frames as illusions is analogous to the often false boundaries used to demarcate the self. Christina Quarles (b. 1985, Chicago, Illinois) works in the El Sereno neighborhood of Los Angeles. She received her BA in studio arts and philosophy from Hampshire College, Amherst, in 2007, and MFA in painting and printmaking from Yale University, in 2016. Forthcoming exhibitions include University of California, Berkeley Art Museum & Pacific Film Archive (2018) and Jessica Silverman Gallery, San Francisco (2018). Her work has been exhibited at the New Museum, New York (2017); Studio Museum in Harlem, New York (2017); David Castillo Gallery, Miami (2017); Skibum MacArthur, Los Angeles (2017); LAXART, Los Angeles (2017); Rubell Family Collection, Miami (2017); and Armory Center for the Arts, Pasadena, California (2016). She is a recipient of the Rema Hort Mann Foundation Emerging Artist Grant (2017) and J. Paul Getty Foundation Grant (2006, 2005) and has completed residencies at Fountainhead (2017) and Skowhegan School of Painting and Sculpture (2016).